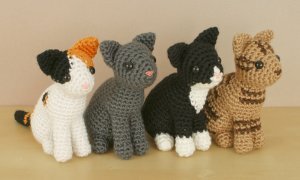 Four original crochet amigurumi cat patterns (Single-Coloured, Tuxedo, Calico and Tabby) by June Gilbank. Buy all four patterns together here and save 1/3 on the price of buying them separately - that's a great deal! Two-page appendices for both right- and left-handers that clearly explain my innovative method for joining the legs and body while you crochet so they sit at exactly the right angle in the finished cat. Bonus instructions to crochet the (optional) pictured nose from crochet thread or embroidery floss and a 1.25mm/size 9 steel hook. Instructions for making a simple felt or embroidered nose are also given. These are modular patterns: save paper and ink by printing only the appendices you need, from only 1 of the 4 patterns (crocheted nose; right-handed or left-handed assembly guide, or neither). Date Added: 11/13/2016 by Petra A. Date Added: 04/13/2015 by Judy C.
Date Added: 02/19/2015 by Janet Y.